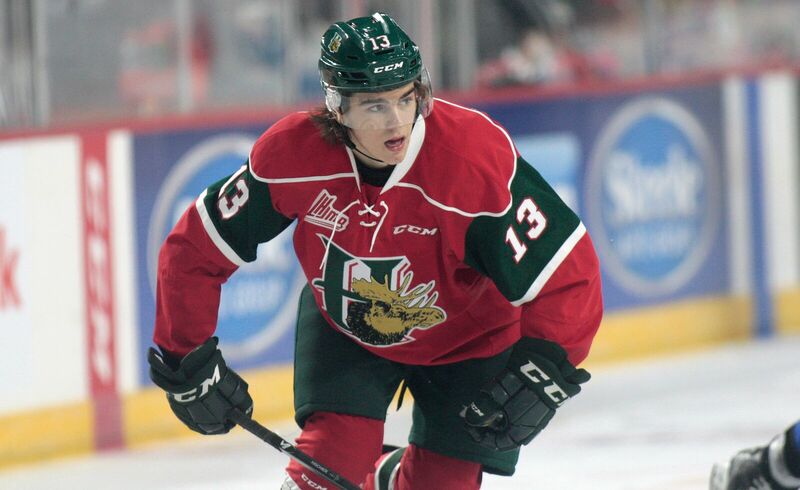 The last player from the QMJHL to be selected in the top-2 of the NHL Entry draft was Nathan MacKinnon back in 2013 – four years later it’s another Halifax Moosehead forward that has the potential to do the same. Nico Hischier comes into this year’s CHL Top Prospects game as the captain of Team Orr and the consensus number two prospect in the coming draft. The game takes place in Quebec City next Monday night and Hischier will be accompanied by only four other players from Quebec – all of which will be playing with Team Cherry. With so few high-end prospects this year, it’s further evidence that the QMJHL is continuing to lag behind its cousins in Ontario and out west. Since it’s possible that this will be your first exposure to these players, let’s take a look at the five players that will be playing Monday night from the Q. A couple weeks ago, I described Nico Hischier as this year’s Patrik Laine – a very good prospect that people will hot take to the #1 spot thanks to a tremendous World Juniors but that ultimately ends up as a very nice consolation prize. Through the first two-thirds of his rookie season, Hischier leads all players in the QMJHL in primary points (56) and total points per games played (1.72). Add his in-season dominance to the way he turned heads at the WJC and Hischier is showing that he has the skill to make an impact in the NHL very soon. Hischer is a very skilled player and one that always seems to have the puck on his stick. He is very dangerous off the rush and has a creativity with the puck that causes fits for defenders. Hischier is a very smooth skater and plays with an ease and fluidity to his game that is not unlike a young Mr. Nylander in Toronto. Coaches and scouts rave about his ability to read the play. He has instincts and a sense for the hiwna shift will unfold that can’t be taught and that result in Hischier always being in the right place at the right time both offensively and defensively. As with most 18-year olds, Hischier is going to have to put on some muscle in order to play center in the NHL, but he is absolutely one of the best two or three prospects in the draft – something he will be looking to show off on Monday night. Morand has 46 points through his first 46 games this season, which is good enough for second on his team in scoring. At 5’9, 165lbs, he doesn’t exactly scream NHL, center but he has the raw skill to be an intriguing prospect when he is drafted in the second or third round. After being selected 2nd overall in the 2015 QMJHL draft, Morand turned in an impressive rookie season contributing 50 points in 48 games for the Titan. He is a speedy and skilled playmaker that has the ability to create offense for his linemates through both puck possession and by winning battles – something that is impressive for a guy his size. He’s a smart player that always seems to see the play developing one or two steps ahead of his opponents. Morand had a very good showing at the U-17 championship (6 points in 6 games) and he will be looking to show he belongs with the best prospect in the draft. He’s a guy that has been dropping in some rankings but a good showing Monday night could change the mind of some scouts – then again he’s 5’9 so we know there will be those who have already soured on him. Comtois was drafted third overall in the QMJHL draft – one spot after Morand – and looked to be a player that would be selected at the top of the draft after a great rookie season. He’s taken a bit of a step back this year but is still projected to be selected in the middle of the first round. Comtois is a big bodied winger that does his best work cycling the puck down low. He’s fast, skilled and has drawn many comparisons to last year’s surprising 3rd overall selection Pierre-Luc Dubois. Like Dubois, Comtois has the skill and finesse to create his own offense and the strength to maintain possession in traffic. Once regarded as a top-5 prospect in the draft class, Comtois’ inconsistency has hurt his stock quite a bit this season. He has all the tools to be a successful NHLer and while he hasn’t developed the way many would have hoped this season, Comtois is a guy that I could see surprising many on draft day and beyond. The younger brother of Team Canada World Junior member Mathieu Joseph, Pierre-Olivier is a high-end two-way defender that is flying up the draft rankings this season. As one of the younger players in the draft, Joseph is showing that he has the tools to be a top defenseman while still having a ton of room to grow. He shows mobility and excellent hockey sense and has that feel for where the play is going before it gets there. He breaks up rushes and plays in his end with a good stick and strong recognition. Joseph has the ability to be a power play quarterback as he controls and distributes the puck with a poise beyond his age. He has a frame that will allow him to get bigger and as he gets older and with a little more strength, it’s not hard to imagine Joseph being an absolute force on the blue line. His play Monday night won’t make or break anything, but a strong showing could go a long way to continue his ascent up the draft rankings. Projected as a very late round pick in the draft, Crête-Belzile is a player that could use Monday’s game to open the eyes of a few scouts that have overlooked him. He is nothing close to an offensive threat as he has zero goals and only three assists on the season. Crête-Belzile is playing on a very strong Armada team and as such, he sits rather low on the depth chart – something that results in him not being asked to do very much beyond lining up against bottom-6 opponents. He will be one of the youngest players selected in this year’s draft and whichever team picks Crête-Belzile will do so knowing that he is a project that is going to take a long time to reach his full potential. Sitting on the bottom pair for his team, Crête-Belzile will be looking at the top prospects game as a chance to show what he can do playing both with and against high caliber players. Playing for a very good Saint John team, D’Orio only has a .901 sv% in 21 games this season. He also didn’t look overly impressive in his two games at the World U17 tournament. What D’Orio has is size, athleticism and a projectable frame. As he develops and picks up a bigger workload next season, D’Orio will have to show more consistency and the ability to play behind a team that doesn’t necessarily give up many shots.